New Delhi, March 27: Niche bike maker Royal Enfield Wednesday said it has launched all new Bullet Trials Works Replica range in India. The Bullet Trials 500 is priced at Rs 2.07 lakh, while Bullet Trials 350 is tagged at Rs 1.62 lakh (ex-showroom). The bikes come with various features like dual channel anti-lock braking system(ABS), trimmed mudguards, a single seat, and luggage carrier. "The Bullet Trials 2019 motorcycle is inspired by Johnny Brittain's trials motorcycle that won more than 50 championships between 1948-1965 and it is also a fitting tribute to our seminal design and engineering expertise that introduced the swingarm for the first time in 1949 with the Bullet," Royal Enfield Global Head, Product Strategy and Industrial Design Mark Wells said. 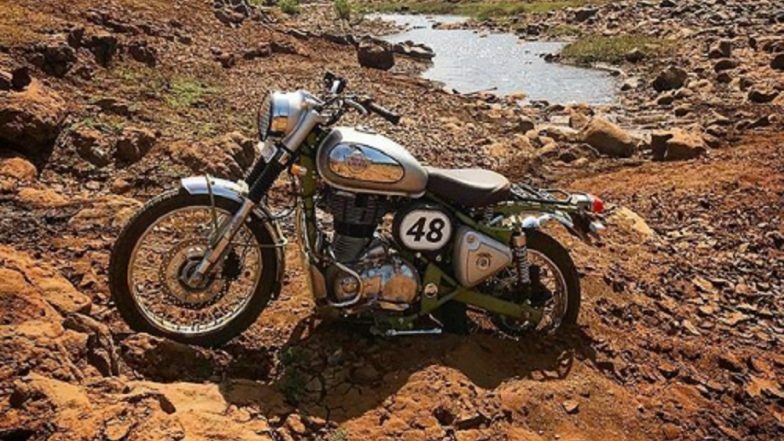 Royal Enfield Price Hike: RE Bikes To Become Expensive From February 1, 2019 - Report. Inspired by Johnny Brittain’s champion Bullet and the Royal Enfield Factory Team’s tremendous success at the International Six Days’ Trials, the Bullet Trials Works Replica is an homage to a motorcycling legend. He further said: "I am confident that this motorcycle will be received well amongst Royal Enfield enthusiasts in India." The Bullet Trials 500 is powered by 498cc engine, while the Bullet Trials 350 is powered by a 348cc powertrain. Royal Enfield plans to launch the bikes globally across all the key markets through this year.